Our public value mission places social and economic improvement at the heart of our teaching, research and engagement activity. We recognise that business and management has an important role to play in tackling the grand challenges facing society. Crucially, public value underpins and informs our engagement with the small business and social enterprise sectors, and also how we promote a culture of enterprise amongst our students. Running a small business or developing a new commercial or social enterprise is a significant undertaking and presents a unique set of challenges and demands. We provide targeted support and development opportunities through our teaching, research and engagement activities, accessible to the small business community. We also have a strong track record of supporting industry bodies and policymakers in better understanding the challenges facing the small business community. Our work with them helps to facilitate the development of policies and support mechanisms that will enhance small business growth and promotes an enterprise culture. We provide tailored research and development support for small businesses and SMEs through a range of mechanisms. A multidisciplinary collaborative research and development programme part-funded by the European Regional Development Fund through the Welsh Government and its four participating Welsh Higher Education Institutions. Manufacturing SMEs throughout West Wales and the Welsh Valleys can harness world-leading research expertise through ASTUTE 2020 to facilitate implementation of new business ideas or enhance the growth prospects and long term sustainability of their existing businesses. The multidisciplinary ASTUTE 2020 team is able to provide specialist support in introducing advanced manufacturing technologies and/or improving their business processes. Reid Lifting Ltd, a leading designer and manufacturer of portable lifting systems on a project aimed at optimising their business systems to support their continued growth and facilitate new service-based revenue streams. Brickfab, a leading manufacturer of prefabricated building products such as chimneys and brick arches, for the UK House Building industry to enhance their continuous innovation capability and deliver a new and reconfigured product range, laying the foundation for diversified and sustainable growth. Building on our reputation as a pioneer in research and knowledge exchange related to lean systems thinking, we have recently spun out the Lean Competency System (LCS) as a commercial enterprise. The LCS is a University developed and industry recognised lean qualifications framework for developing lean thinking knowledge and practical skills in the workplace. 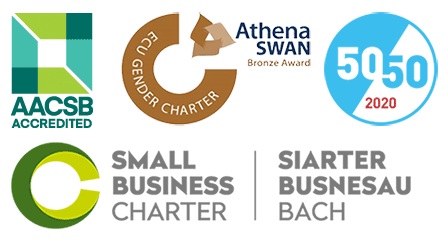 LCS works with firms of all sizes and also individuals but has developed a specific accreditation programme for SMEs, designed for the needs and operating conditions of start-ups or smaller companies. We offer specialist development opportunities for those with high entrepreneurial interest and potential to set up their own business, or to work in a new venture development capacity in an established organisation through our highly successful Business Strategy and Entrepreneurship (MSc) programme. We are actively working to ensure that our varied and expanding portfolio of placements and graduate opportunities caters for and supports the small business community, through facilitating access to bright, enthusiastic talent in a way that works for your business. Cardiff University’s Grangetown Community Gateway project. Our ongoing support for Cardiff University’s Enactus Student enterprise society which has worked with organisations such as the Huggard Centre and the Wales Council for Voluntary Action in support of vulnerable members of society such as the homeless and refugees.